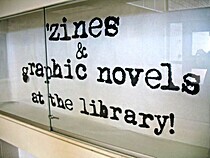 About meWe are the library at the Plymouth Regional High School and have recently added 'zines to our collection. We'd like to hear from other high schools that are doing this! About my libraryHome to a giant rubber band ball!